In the original trilogy, George Lucas highlighted the grim realities of war. The hero’s victory in battle was always accompanied by the visual depiction of the death of friends and comrades. Paradises were created and lost, and individuals who had no role in the fighting suffered, from Jawas to moisture farmers. When Lucas returned to the Star Wars universe for the prequel trilogy, he brought those themes with him, but also spread across the breadth of the three films a warning message of not just how war is terrible, but how it can be wielded by those on the quest for power and at the expense of democracy. That message is introduced in the beginning, in The Phantom Menace. Some fans are quick to ridicule The Phantom Menace as a movie about trade disputes, complaining that the first entry in the Star Wars cinematic library was inexplicably dull compared to the original trilogy. Yet, it’s the trade dispute which initiates the discussion on war that is conveyed through the next two films. Primarily, politicians have and will use war to affect political ends with little disregard for the consequences of those who find themselves either an unwilling party or willing, but deceived participant. The first act of the film references the idea of paradise lost by the intrusion of war with the arrival of the Trade Federation droid army on the surface of Naboo. The army’s machinery crushes the vegetation and sparks a deluge of wildlife fleeing for their lives, and ultimately, its presence forces the Gungans, living in at least the perception of remote safety into battle. The droid army introduced in The Phantom Menace represent literal puppets in the hands of the Trade Federation, and later the Separatist movement at large. Soldiers are sent into battle, as we later learn, to fight and die entirely for the political scheming of Darth Sidious, aka Sheev Palpatine, Senator of Naboo. For those gazing at the droid army from an anti-war perspective, they might argue that soldiers in our world fulfill the same function – individuals created purely to die for no high purpose than politics. This point of view is heightened in Attack of the Clones with the introduction of the Clone Troopers, who are born, live, and die, entirely for the sake of war. The war on Naboo, given dark undertones with references of suffering and internment camps, ultimately serves the purpose of pushing Palpatine into the position of chancellor of the Galactic Senate of the Republic. At this point, the message is already becoming clear to the viewers, who are already familiar with who Palpatine becomes, that war can be used merely as tool and not the last resort of those who fight on the moral side of good, which is the position of the original trilogy. Over the next two films, Lucas guided Palpatine’s growing power to parallel the expansion of war across the galaxy, from the start of the Clone Wars in Attack of the Clones to its end in Revenge of the Sith. Between those two films, Palpatine “reluctantly” orchestrates the creation of a second military force purely to fight the droid armies of the Separatist movement that he, himself, had created through shadowy machinations. 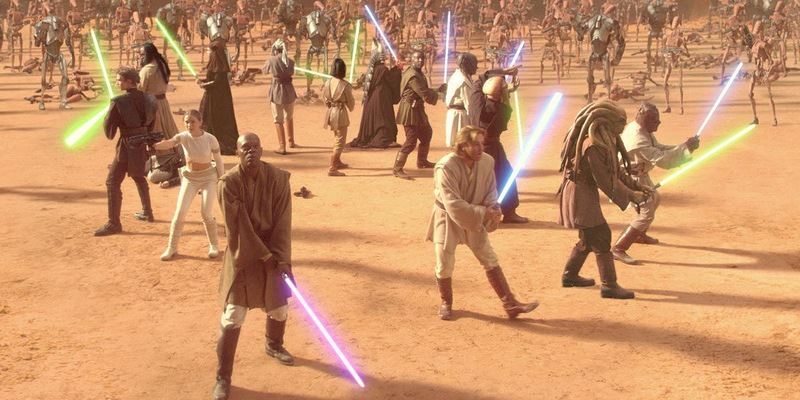 The “need” of the Clone Army is painfully clear at the end of Attack of the Clones, when the Jedi cavalry is overwhelmed by a superior number of droids. Only Yoda arriving with the recently discovered clones saves the day and puts the Separatist to flight. In a single moment, Palpatine’s argument for a Republic military is made with the Jedi, long the protectors of peace in the galaxy, proven unable to handle the scope of the Separatist threat. It’s important to note, for the purposes of Lucas’ argument in the prequel trilogy, that every time Palpatine moves the Republic further into war and convinces the Galactic Senate to give him additional powers, it’s to applause. This is true at the time of the creation of the Grand Army of the Republic, followed immediately by the somber statement by Yoda declaring the beginning of the war with a remorseful Senator Bail Organa beside him, and also true when the Senate gives Palpatine dictatorial powers (thanks Jar Jar!). The message is pointed, dictators rise through popular demand, and in this case, upon the political leverage provided by a wholly contrived war. The war only ends when Palpatine declares himself emperor, having used the chaos, horror, and destruction caused by the war to lure the inhabitants of the galaxy to accept his promise of peace and order via the creation of an empire. The prelude to this declaration are years of war in which the Jedi have fully committed themselves across dozens of fronts, having not just sacrificed their adherence to their own code of conduct, but also their reputation in the eyes of the galaxy. By Revenge of the Sith, the Jedi are already seen as the enemy by every citizen of the Separatist confederacy, and one cannot call one’s self a defender of the peace, when leading troops into battle. Their participation in the Clone Wars has sullied their name, and when the trusted Palpatine declares them traitors, the galaxy simply rolls with it. And so, another negative ramification related to war, the ruination of something which originally stood for the betterment of all. Order 66 occurs and the galaxy, worn and weary from war, hardly blinks. While Revenge of the Sith hops around from several different battlefields, it’s the short montage of Order 66 which strikes an emotional beat stronger than almost any other moment in Star Wars cinematic history. The command from Palpatine to the Clone Troopers to kill the Jedi is gut wrenching, but also informative. First is the perspective of what the Clone Army represents, an army that serves simply to wage war and not for any grander purpose (despite what the Clone Troopers, themselves believe) is one which can be turned on anyone at anytime, including those who had previously thought it loyal to themselves. This was grimly depicted when the clones ruthlessly slaughter the Jedi whom seconds before had been their commanders and fellow soldiers in arms. Caught completely by surprise, only a handful survive the Force user massacre. The second point to consider touches on those who do fight for a cause. For the idealistic who pick up arms, be wary of whom one does for, because the idealistic can be taken advantage of. The place of the Jedi in the Clones War, formerly the defenders of peace and justice in the galaxy, is one, as stated above, which ruins the Jedi Order. Their participation in the war, idealist in support of the preservation of the Republic blinds them to the assumption of the most powerful political position in the government by their ancient Sith enemy. While they believed they fought for the Republic, they truly only fought to help further Palpatine’s plans. As noted above, once the galaxy was primed to embrace the Empire, Palpatine dispensed of the Jedi Order that had lost its way. Revenge of the Sith concluded with the surviving Jedi fleeing into isolation, no longer strong enough to oppose the Emperor or his empire. It also concluded with the end of a war orchestrated entirely by one man to destroy a democratic government and at the same time propel him into the highest position of power. Nothing positive can be said to have risen from the Clone Wars with none benefiting from them except for Palpatine. George Lucas’ message filtered through the prequel trilogy, itself produced in a time when the United States was engaged in multiple wars, is clear. War is not glorious, but instead something to be highly wary of, as there are wars which are just and those which are not. The Clone Wars, depicted in the prequel trilogy, represent the latter, and with their use to undermine democracy and to destroy an otherwise benevolent order of peacekeepers, are intended to give the viewer pause and somber reflection of how the wars in Star Wars should be understood.